Walk through our doors and step into the past….. The American Foursquare home was built by Thomas Nichols Putnam, the Carrington area’s pioneer lumber man, and his wife, Clara Belle Putnam. The Putnam’s were settlers to Carrington in 1886 while North Dakota was still a territory. They were town and community buildings through T.N.’s commerce and their volunteer activities until their deaths in the 1930’s. The home remained in the Putnam family until the estate sale in 1955 at which time the home was purchased by Anna Firlus Hayashi. Anna was the widow of Harry Hayashi, a native of Tokyo who was well known for building Rainbow Gardens in Carrington, with guest cottages, gardence a café and a dance pavilion, all replicating his native Tokyo. In 1959, the Trinity Lutheran Church purchased the home, using it as an educational facility through the 1960’s. 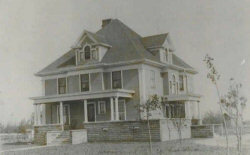 The Putnam House became a family home once again in 1970 when Robert and Carol Montgomery purchased the home. They were the longest owners of the home, living there for 19 years. In 1989, former local teachers, Barry and Radell Tasa, purchased the home and lived there until they relocated to Nebraska in 1991. With the home being vacant and for sale for some time, local residents John and Julie Gardner purchased the home in 1992 after an out-of-town buyer began bidding on the home with plans to move it from the community. 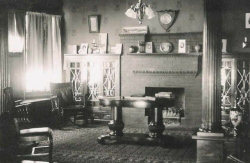 The Gardners were instrumental in forming the Putnam Cultural Heritage Association with the home being used as a cultural center for several years. The home was later used as a residence by the Gardner family until their relocation to Missouri in 2000. And once again, the home remained vacant with the fear of it being sold and moved from our community. The local Foster County Historical Society began exploring purchase options and in November of 2001, they became the new owners, with the hopes of returning the home to a culture center in conjunction with the Foster County Museum. That brings us to today, where the Foster County Historical Society and Putnam House Committee continue to see the vision John and Julie Gardner once had for the home.